Numerous political and military leaders around the world hold simultaneously different positions of authority, each with specific powers of execution. For example, the President of the United States is also the Commander-in-Chief of the United States military. Most national leaders throughout the world hold similar authorities. Another example is the Commander of United States Forces Korea who also serves as the Commander of the United Nations Command, Commander of the Republic of Korea—United States Combined Forces Command, and the senior U.S. military officer assigned to Korea. Each of these positions holds specific authorities that enable him to make specific military decisions during armistice and crisis situations on the Korean peninsula. 1. Supreme Leader of North Korea. Best translated as “supreme leader,” the suryong concept was initially based on party ideology first developed in 1967 by Kim Il-sung’s younger brother, Kim Yong-ju, and promulgated later by Kim Jong-il. Through the Ten Great Principles of Monolithic Ideology, the suryong/supreme leader concept has been utilized by the regime to demand from every North Korean citizen the study of, and obeisance to, the ten principles. As a consequence, the concept of supreme leader is how every North Korean understands leadership in the North. These principles are inculcated into every North Korean from government minister and military five-star to kids in kindergarten—no exceptions, nobody. It is through these ten principles and the concept of the suryong that human rights denial is vigorously pursued by the regime under the supervision of the KWP Organization and Guidance Department (OGD). 2. Chairman, Korean Workers’ Party (KWP). The KWP Charter was amended at the 7th Party Congress in May 2016 to state the “KWP Chairman is its supreme leader who represents the party and leads the whole party." Through this authority, Kim Jong-un oversees all party functions within every geographical and functional area of North Korea and its society down to party cells at the most remote villages in North Korea and the most distant enterprise or embassy overseas. It is the ultimate political organizational authority that enables Kim to hold other party positions and to supervise party control of the government, the economy, and the military. The DPRK Constitution states: “the Democratic People's Republic of Korea conducts all activities under the leadership of the Workers' Party of Korea.” By extension, the party chairman oversees that designated conduct. Furthermore, the 7th Party Congress amended the KWP leader’s title from First-Secretary to “KWP Chairman,” thus assuming the party title that Kim Il-sung used from 1946 to 1966. 3. Director, KWP Organization and Guidance Department (OGD). Kim Jong-il was appointed to this position in 1973 by Kim Il-sung to succeed Kim Yong-ju. Kim Jong-il rebuilt this department to channel the entire party’s reporting and personnel evaluation systems under his personal control and never gave up the post, even after becoming the KWP General Secretary in 1997, and held it until his death in December 2011. Why? The reason is Kim Jong-il turned the OGD into the clearing house for all policy vetting and senior official assessments based on OGD-led daily political evaluations and police surveillance. Anybody who is somebody in North Korea is there because the OGD has vetted them, and in return, the OGD is respected and, most of all, feared. One cannot be a military flag officer, a government minister, an economic advisor, or a senior party cadre unless the OGD has vetted that person for the supreme leader’s approval. No policy recommendation crosses Kim Jong-un’s desk unless it goes through the KWP OGD for verification to be in line with Kim’s guidance. The OGD is the singular most politically influential organization in the Kim regime and serves as center mass for control of the entire party-state. It does not control the guns of the military or security services, but it controls each and every one of those organizations’ leaders. There have been scattered reports that Kim Jong-un’s aunt, Kim Kyong-hui, and/or his sister, Kim Yo-jong, has taken over as the OGD Director, but there is no substantiation or confirmation of such reports. Indeed, the reason Kim Jong-il kept the position even after gaining the ultimate party position is that he could not trust another person with so much power. Until North’s Korea’s state or party media publishes the assignment of another person as the OGD Director, we must assume Kim Jong-un is doing the same as his father, i.e. maintaining North Korean leadership control close to his chest through the directorship of the KWP OGD. 4. Supreme Commander, Korean People’s Army (KPA). This position commands all strategic and operational aspects and decisions of the North Korean military. The position of KPA Supreme Commander came about through “strong recommendations” from Soviet Union leader Stalin in return for Soviet support for Kim Il-sung’s war effort in 1950. Subsequently, the KWP appointed Kim Il-sung as KPA supreme commander in July 1950, soon after the war started. Kim Jong-il became supreme commander in 1993, and Kim Jong-un in December 2011. Through an expanded meeting of the KWP Politburo, this was the first title conferred on Kim Jong-un after his father’s death, thus demonstrating the importance of the position within the regime in controlling the military. The KPA Supreme Commander oversees three reporting chains, a system Kim Jong-il put in place in the 1970’s to ensure maximum control over KPA leaders. 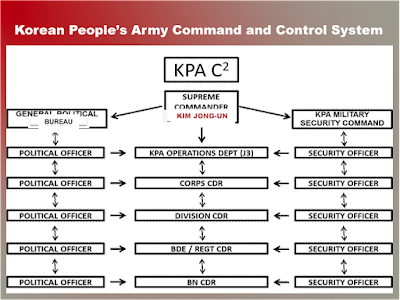 The three chains are the standard commander-to-commander chain; the General Political Bureau chain whereby the political officer at every level of command from battalion to the KPA General Staff, as well as frontline companies, reports independently from the commander; and the Military Security Command officer who separately parallels the chain of the political officer (see rendition of this command and control system above). It should be noted that Kim holds the military rank of Marshal of the Republic (국가원수). This is the highest military rank in the KPA today. Kim Il-sung held the rank of Generalissimo (대원수), and the only one to do so. There is a lesser rank of Marshal of the KPA (인민군 원수) for a handful of former anti-Japanese partisans who supported Kim Il-sung, but that is a different and subordinate designation. 5. Member, Standing Committee, KWP Politburo. The mission of the KWP Politburo is to organize and direct all party work on behalf of the party's Central Committee between plenary meetings. From this position, Kim Jong-un leads all policy deliberations for national directions and goals. Under Kim Jong-il, Politburo meetings were not held at all as Kim Jong-il made all decisions on his own. But Kim Jong-un has demonstrated an interest in holding such meetings, the most memorable being the arrest of his uncle, Jang Song-taek, as distinctly displayed in the North Korean media. 6. Chairman, KWP Executive Policy Bureau. At the 7th KWP Congress in May of 2016, the KWP Secretariat was replaced by the KWP Executive Policy Bureau. Kim Jong-un was designated chairman and former party secretaries were re-designated vice-chairmen. From this position, Kim Jong-un supervises all policy implementation within the party-state. The KWP Executive Policy Bureau ensures the supreme leader's guidance is carried out through direct political supervision of DPRK government functions and procedures. 7. Chairman, KWP Central Military Committee. From this position, Kim Jong-un oversees all military policy consultation, deliberation, and decisions that impact the North Korean military, whether military, government, economic, or social. It is this position that is most critical to crisis decision-making. During Kim Jong-il’s rule, he did not hold meetings of the KWP Central Military Committee, making all decisions based on forwarded recommendations from military leaders and agencies/commands. 8. Chairman, DPRK State Affairs Commission. On June 29, 2016, the 4th Session of the 13th Supreme People’s Assembly (SPA) amended the DPRK’s socialist constitution to establish the DPRK State Affairs Commission, thus replacing the authority of the National Defense Commission. Kim Jong-un was designated by the SPA as the Chairman of the State Affairs Commission. From this position, Kim Jong-un oversees state implementation of party decisions on all programs and projects in every field of North Korean society. Kim Jong-un also holds two other positions: membership in the KWP Central Committee and in the DPRK Supreme People’s Assembly. The former position is within the KWP senior membership organization that carries out no direct decision-making processes but is designated as the organization that oversees all party affairs. In reality, it is the “good-old-boys club.” The latter position holds no decision-making authority, only voting authority in what is a rubber-stamp legislative body blindly subservient to party direction. Though it may be the least known title understood by the Western world, there is no title more effective at imprinting upon the North Korean populace the supreme leadership other than the title “suryong.” However, respect for Kim as the suryong has proven to be far less than that of his father and grandfather. If there is a weakness within the leadership identification system, one has to look no further than that. For a detailed discussion on the suryong (supreme leader), see Robert Collins, Pyongyang Republic: North Korea’s Capital of Human Rights Denial (Washington, D.C.; Committee for Human Rights in North Korea, 2016), pp.18-21. Lee Sang-hyun, “北 개정헌법 살펴보니…'최고영도자' 김정은 권력집중에 초점 (Looking at the North’s Revised Constitution…”Supreme Leader” Kim Jong-un Focuses on Consolidating Power),” Yonhap News, June 30, 2016, http://www.yonhapnews.co.kr/bulletin/2016/06/30/0200000000AKR20160630057551014.HTML. Korean Workers’ Party Charter, 2010, http://world.moleg.go.kr/KP/law/24980?astSeq=580. Kim Soo-yeon, “N.K. adopts decision to elect its leader as ruling party's chairman,” Yonhap News, May 10, 2016, http://english.yonhapnews.co.kr/northkorea/2016/05/10/95/0401000000AEN20160510001551315F.html. After 1966, Kim Il-sung and Kim Jong-il used the title “General Secretary.” See http://en.paperblog.com/power-organizations-after-7th-party-congress-1472350/. Torkunov, A. 2000. The War in Korea 1950-1953: Its Origins, Bloodshed, and Conclusion. Tokyo: ICE Publishers; see also Ko Jae-hong, 북한군 최고사령관 위상 연구 (Studies on the Status of the North Korean Military’s Supreme Commander) (Seoul: Korean Institute of National Unification, Policy Studies No. 06-07, 2006); pp. 37-38. See Lee Tae-kun, 북한군 총정치국 (North Korean Military’s General Political Bureau) in Chun Yun-jun, et al, 북한의 군사 (North Korea’s Military) (Seoul: Kyongin Munhwa Publishing, 2006), pp.169-205. 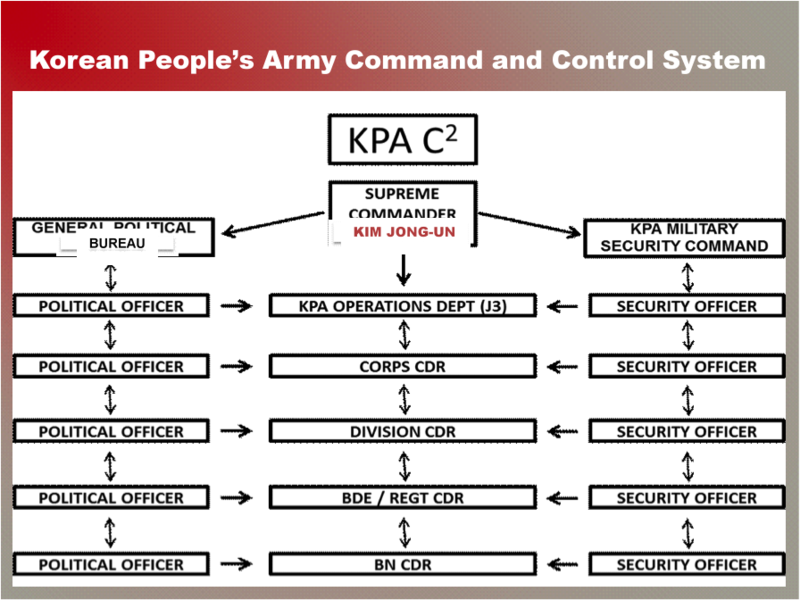 Yoon Kyu-sik, Understanding the Korean People’s Army: the Military Security Command, Republic of Korea Army Administration College, accessed June 28, 2010, http://kookbang.dema.mil.kr/kdd/CultureTypeView.jsp?writeDate=20080324&writeDateChk=20070712&menuCd=2004&menuSeq=36&kindSeq=1&menuCnt=30917. This does not mean that the National Defense Commission has been disbanded. Kim Song-hun, “김정은, 北헌법 바꿔 국무위원장 추대 (Kim Jong-un, North Korea Change Constitution, Appoint Kim as Chairman, State Affairs Commission),” Maekyung News, June 30, 2016, http://news.mk.co.kr/newsRead.php?no=468243&year=2016.